An unusual event sponsored by an uber-wealthy Chinese tycoon to feed New York City’s homeless and gift them hundreds of dollars took place as promised on Wednesday, though not without a fair amount of chaos. Last week, several full-page newspaper ads put out by flamboyant Chinese millionaire Chen Guangbiao in The New York Times and The Wall Street Journal advertised an event for the homeless in Central Park, promising a gourmet meal for hundreds and $300 in cash for each person. On Wednesday, several news outlets found a throng of homeless people waiting patiently for the luncheon to begin. Some had camped out in Central Park overnight. Ultimately, 250 homeless New Yorkers were granted entrance to the upscale Loeb Boathouse restaurant, and served sesame-seed encrusted tuna, beef filet and berries with crème fraiche. The meals were served by some three dozen volunteer waiters, sporting green uniforms inspired by those of China's People's Liberation Army. At one point, Chen took the stage to sing a rendition of "We Are the World" to the crowd. Not to be outdone by the pro-Communist Party sentiment throughout the event, a group of protesters gathered outside the restaurant, chanting "Chinese Communist Party is evil! Chinese Communist Party is terrible!" An apparent lack of communication marred the event, however, with some 100 of the city’s homeless left shut out. Duwell, one of those who found himself out in the cold, called the event "the worst fraud [he] has ever seen perpetrated against the homeless community," reported Vice News. "I am handicapped, and I have been waiting here for 10 and a half hours. I have been chased by the police and treated with disrespect after we were promised a gourmet meal and $300. This is a publicity stunt." From there, things did not become any clearer for those in attendance. 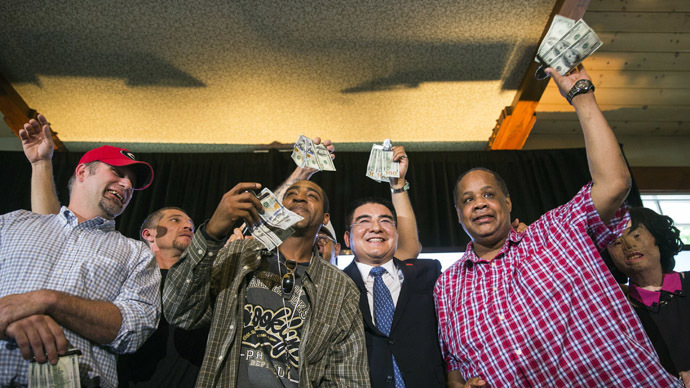 Though Chen had said that cash would be handed out to attendees, a press release distributed by the Rescue Mission shelter – which organized the event – said that was never the intention. But soon after a spokeswoman made that announcement, Chen himself got on stage and said he would indeed give everyone $300 if they came to the Rescue Mission to collect it. The 250 homeless people were then loaded onto buses headed for the Mission's headquarters. But Chen never showed up, prompting the group to suspect they had been duped. Likely hoping to rout more dissatisfaction with Chen, Craig Mayes, the executive director of the Rescue Mission, spoke to the crowd that had assembled back at the center. Mayes comments did not appease everyone, however, as he was drowned out by shouts of “f**k you” from the group, reported Vice. “We have been duped to come along here under false pretenses and now we are just part of a propaganda trick for the rich,” Harry Brooks, a Vietnam veteran who attempted to reach the stage during the luncheon to voice his complaints, told The Telegraph. Unlike Brooks, however, some of the homeless people at the luncheon unaccustomed to gourmet meals found it lacking.